This is Norma the Fire House Cat, she has been with the Fire Company for 4 years. She enjoys playing and cuddling with guest who visit the Fire Company. She can be seen walking around or laying down outside the Fire House on nice days and guards the Ambulances and Fire Trucks while inside. She enjoys eating fish and will eat other meats at times, she especially enjoys her snacks. Norma has her own fire gear and is a camera hog enjoying her life as a member of this Fire Company. Everyone who visits enjoys her company and she loves to be around people. One of the things she enjoys is playing hide and go seek with our Fire Chief. Everyone here loves Norma and she loves everyone too. 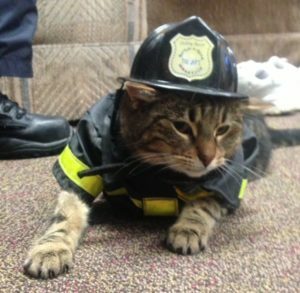 Three cheers for Norma the Fire House cat.